The Hamptons – it’s the New Yorker getaway. Stretches of highway are adopted by Sotheby’s. “Villages” are dotted with luxe home good stores and couture boutiques. It also happens to be overflowing with loads of fresh, local produce AND – wait for it – wait for it – roadside farmer’s markets. It was all I could do to not make Rajat pull over to compare the goods at each one on our drive back. Amongst the bounty I scored were ears of sweet corn, plump cherry tomatoes, long purple eggplants, a golden orange squash (disappointing – tasted just like yellow squash), green and red bell peppers and local plums. Two ears of corn went into this quick creamy corn and potato soup. The other two ears I curried then roasted with cherry tomatoes and tossed with fluffy whole wheat couscous. 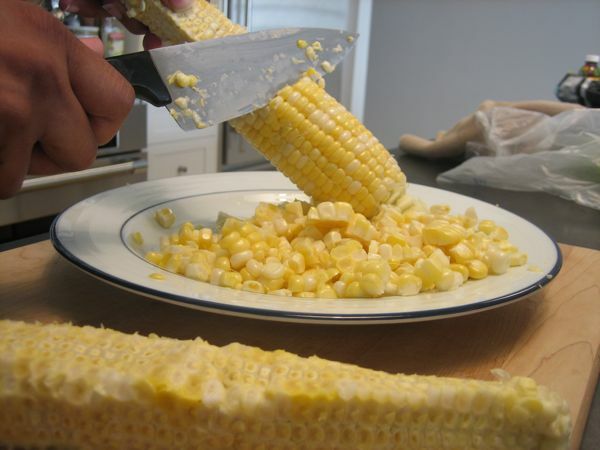 First, remove the corn from the husk then cut the kernels from the cob. Next, make the curry butter. Melt two tablespoons of butter and then stir two teaspoons of curry powder into the butter. Dice a small red onion. Toss in a mixing bowl with the corn and half of the curry butter and mix with your hands or a spoon until the corn is well coated. Spread the corn/onion mixture evenly in one layer on a cookie sheet. I wanted to save time, so I used half of the sheet for the corn and the other half for the cherry tomatoes. Cut two handfuls of cherry tomatoes in half, toss with a little olive oil and place in a single layer, cut side down on a parchment paper lined cookie tray. 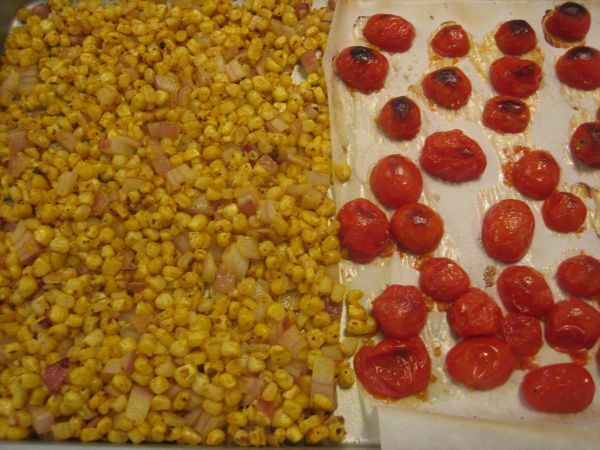 Shower the corn and cherry tomatoes with salt. 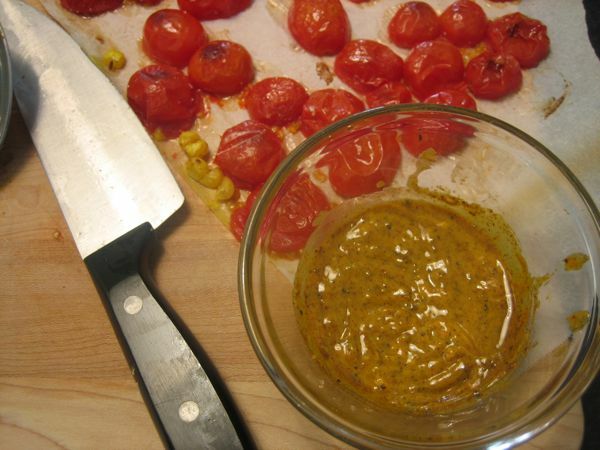 Then place in the oven on medium broil for about 5-10 minutes until the tomatoes are lightly browned and melted. 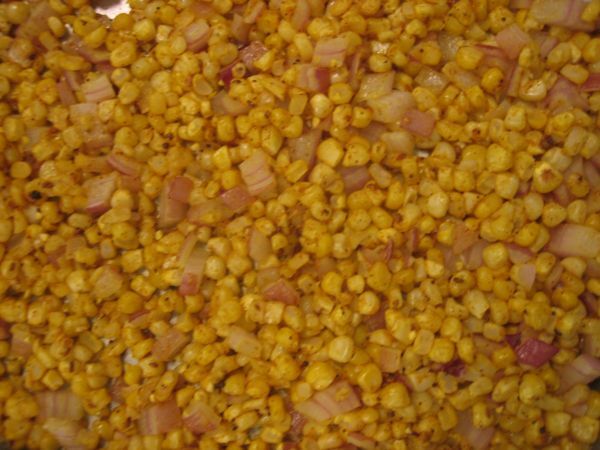 The corn and onion mixture should be lightly browned. Cook about two cups of couscous according the instructions on the package, but substitute the remaining curry butter for regular butter (add it to the water used to cook the couscous). 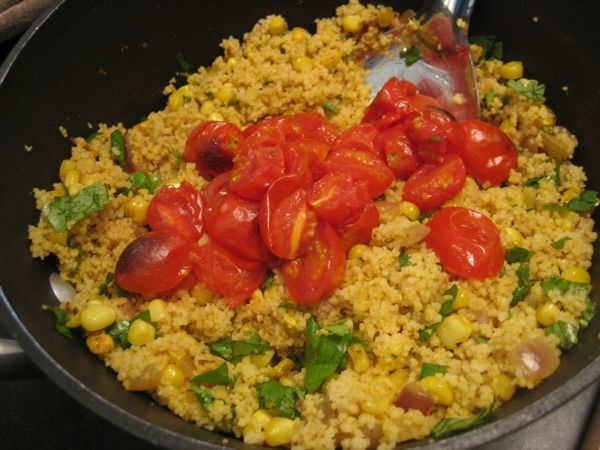 After the couscous is cooked, fluff with a fork then gently fold in the roasted corn, onions and tomatoes. Add salt to taste and garnish with fresh cilantro. Drizzle with about a tablespoon or so of lemon juice. Serve hot. Fed two hearty portions to two very hungry adults. May not be an accurate representation of serving size…did I mention we were hungry? How very interesting…both your write up & this recipe. Can you possibly squeeze another suddenly hungry adult in? Wow, what a gorgeous, colorful dish filled with the flavors of summer. I’ve never been to the Hamptons– don’t know if I could ever afford a short holiday there 🙂 But the idea of streets lined with farmers’ markets sounds divine! Oh my, that looks delicious. The curry butter sounds incredibly good! What kind of curry powder do you use? ND: Thanks! I used this curry powder that I made awhile back. I made a batch of it and stored it in glass jar. I’ve never bought curry powder in the store before, but I know most Indian stores do sell a generic curry powder. Gorgeous couscous, and i love the roasted tomatoes you added! Looks Gorgeous! First time on your blog – you have a wonderful space here! Will be here often now! ND: Ambika, thanks so much for the award. I’ll definitely drop in by your blog. I made this, sort of, and loved it! I didn’t look back at the recipe after seeing it once, so I was very off 🙂 BUT, used 3 ears of corn leftover from roasting, chopped a tomato, and did the curry butter. Roasted it, dropped some Cilantro on, and ate it! But it’d be even better with onions & over a grain…. I’ll have to try with Quinoa. ND: That’s the best kind of recipe I think 🙂 One that you can just use for inspiration. Glad to know that you enjoyed it! Just found your site and am so glad. This recipe looks delicious and your photography is great. I love everything with corn in it. this looks divine!! I tried this recipe and it was amazing. I added garlic to the onions and corn mix, and also added slivered almonds at the end. It was amazing! ND: Thanks for the comment and the feedback! I’m glad to hear that you liked it. Those sound like wonderful additions. Hope you’re doing well. The tomatoes MAKE this dish – beautiful, simple, and delicious!